The Mitsubishi Regional Jet, or MRJ, is Japan's first newly produced commercial aircraft in nearly fifty years, and it's one sweet-looking ride. Four years behind schedule, and powered by Pratt & Whitney, this medium-sized regional jet carries big hopes for Japan's aerospace industry. 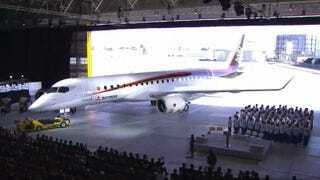 The first completed aircraft was introduced to the public on Saturday, in Nagoya, Japan. Mitsubishi says the MRJ will fly twenty percent more efficiently than current regional jets on the market, and predicts a demand for over 5,000 jets in the 70-90 seat range over the next 20 years. Mitsubishi selected Rockwell Collins' Pro Line Fusion flight deck, which will provide communication, navigation, surveillance, engine indication and crew alerting system (EICAS), and aircraft maintenance systems. The flight management system features graphical flight planning, as well navigational functions. The fly-by-wire cockpit features four 15-inch LCDs. Pratt & Whitney's PW1200 Geared Turbofan engines will power the plane with 17,600 pounds of thrust each. Inside the cabin, the MRJ promises the comfort of mainline aircraft, including large overhead bins, 80 inches of clearance from floor to cabin ceiling, and up to 31 inches of seat pitch. Depending on its configuration, it has a range of up to 1,780 nautical miles. Costing an estimated $1.7 billion in development, Aviation Week says the MRJ incorporates some styling touches (such as the pointed nose), just to make it look good, even if they sacrificed some efficiency. A total of seven test planes will be built, with the first test flight expected to take place in the second quarter of 2015. Mitsubishi has two versions of the plane in the works. The one unveiled on Saturday is the 92-seat MRJ90, and they'll begin building the 78-seat MRJ75 beginning with the eight aircraft. So far, 407 of the planes have been ordered, with Japan's ANA to be the launch customer. Japan's last natively-produced airliner was the NAMC YS-11. It was created to replace the aging DC-3s that were serving Japan in that era. 182 of the planes were built between 1962 and 1974.